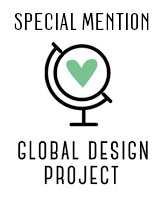 Stampin with Mel: Global Design Project special mention!! Some news! I managed to earn a special mention for my card entered in last week's Global Design Projects sketch challenge ( Challenge #26 )! This was my entry... For a closer look click HERE ! Yay! So happy! Also thank you for all your beautiful comments!!!! We (us?) bloggers thrive on them! Keep them coming! Well I'm about to start on my entry for this week's GDP challenge, so be sure to pop in again!